It's kind of like "Grunge" graphic design. Some people did it well and created some amazing work, and then a slew of imitators popped up and were imitating without any foundation knowledge of what they were doing and drove the style into the ground. It's not the technique or style's fault that it's misused/overused/horribly distorted, it's the "artist's" fault. Or we could just incite the long tail and agree that these things will find their own markets. Some people obviously like extreme HDR work with little scraps of reality clinging onto the image, while some people will use it to good effect, and others still will hold true to conventional photography or other random techniques. 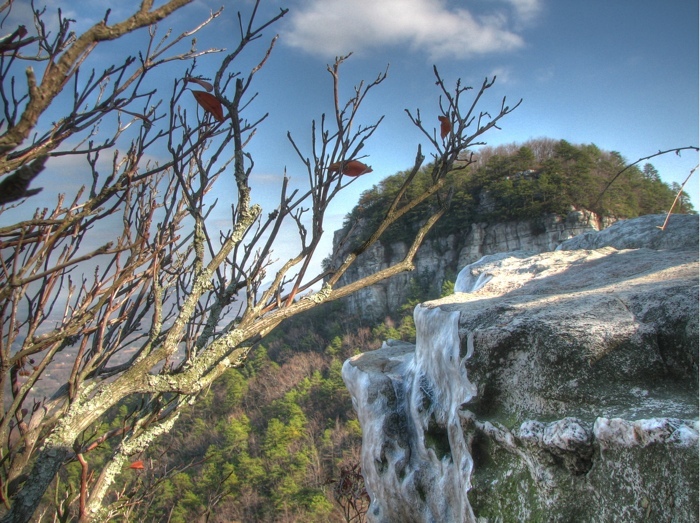 Pilot Mountain back in December. It's only been in the last few weeks that I've sat down and processed a large chunk of photographic back log, and part of that was getting a copy of photomatix to use instead of photoshop's HDR tools (which aren't that nice) or layer masking and blending (which is what I had been doing to decent effect) This one is a photo that wouldn't have worked nearly as well as a single exposure.